Tiny homes continue to grow in popularity all across the country. The epitome of the minimalist lifestyle, a tiny home packs an entire house in a little space, leaving only a little room for books, supplies, and other items. If you’re thinking about building or repurposing a space to use as a tiny home, you will have to come up with some creative storage solutions to have the stuff you need in your house. 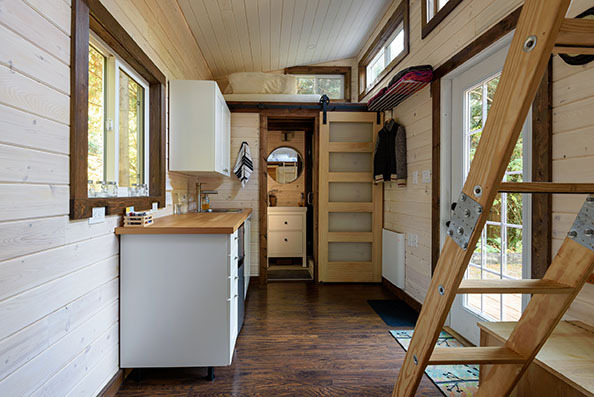 Anyone who has looked into living in a tiny home knows that space is beyond limited. That’s why it’s important to have as many items as possible that have more than one use. A popular storage solution that many tiny homes use is furniture that also doubles as storage. Chairs, beds, and couches can all be created with additional storage built within. Stairs can be built to double as drawers, making good use of that additional space while opening up the second level for a loft or sleeping area. Even consider replacing walls with cabinets that fit flush with each other — they give the illusion of walls but have plenty of space hidden within. With the minimal amount of space available, you have to make the most out of the room you have. This means building in shelves wherever you can — the shower, around doorways, on the stairs, and any other place you can think of. Hang items from the ceiling and utilize any extra space you have between furniture and the floor. Storage solutions are available with a bit of forethought and ingenuity. Wall space is a fairly underutilized place in any house, not just tiny houses. Hang items like pots and pans, have plates with cool designs that can double as wall art, and get creative with shelves and magnets to use both the top and bottom of the shelf. If you have an A-frame structure, you can have the structural frame pull double duty and also function as a shelf! No matter the storage solutions you come up with for your tiny home, you’ll probably have to downsize dramatically. Give yourself some extra time to come up with storage solutions and figure out exactly what you do and don’t need for your tiny home by moving your stuff into a storage unit! At Affordable Family Storage in Topeka, we offer climate-controlled storage units in a variety of sizes so you can be sure your items are safe and secure until you find a way to repurpose or rehome whatever you don’t need. Reserve your unit online today!